RECENT EVENTS — CLARENCE M. DUNNAVILLE, JR.
Clarence Dunnaville receiving the 2016 Strong Men and Women Award sponsored by Dominion Resources and the Library of Virginia. 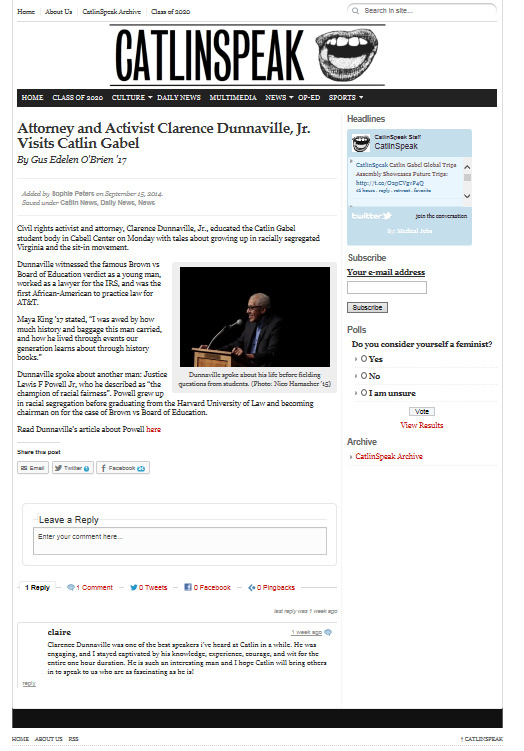 Dunnaville spoke in Portland, Oregon at Catlin Gabel High School about civil rights in September 2014. On Constitution Day (September 18, 2014 Dunnaville Addressed a group of 150 people at Concordia University School of Law in Boise, Idaho. Dunnaville was honored earlier this year by bering named the Richmond Bar Association's Hill-Tucker Public Service Award Winner for 2015.